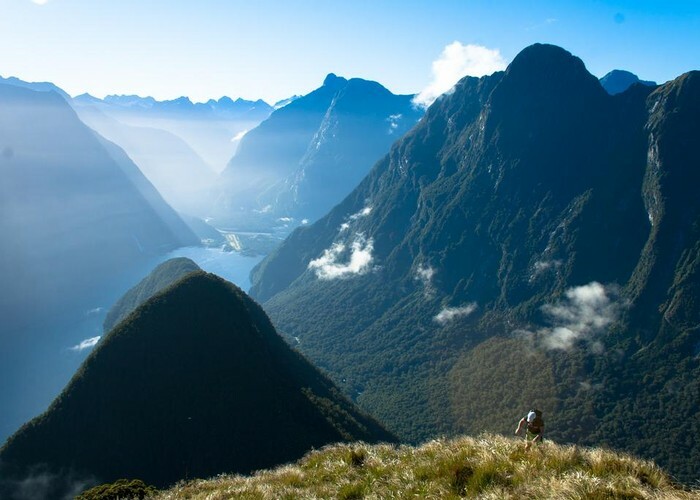 Spectacular views of Milford Sound from an iconic peak. Mitre Peak • By Matthew. 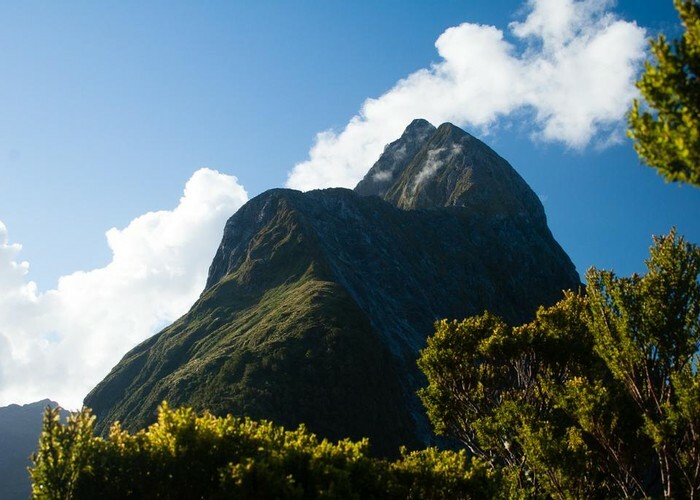 Licence: C.
Note: The summit of Mitre Peak is a straightforward but exposed climb, with the very real potential of falling all the way to the sound far below. Trampers should be accompanied by somebody with rope skills who can protect the route. Alternatively, the ascent into the tops as far as the notch is a worthwhile journey with great views, but without the exposure to falls. Ascending Mitre Peak • By Matthew. Licence: cc by-nc-nd. This peak is usually tackled as an overnight trip with a bivy near the Footstool. Some climbers like to arrange a day trip with a boat across the sound and a helicopter off the summit. From Milford Sound, kayak or raft across to the Sinbad River mouth. This is about 2.5km, and can be hazardous in poor weather. Stow your boat in trees by the beach to the true left of the river, and stock up on water from the river -- there is very little water on Mitre Peak. Kaka play in the trees overhead, and sandflies on the beach are aggressive. A rudimentary track sets off from the far end of the beach, although it is hard to find and prone to damage by tree falls. If in doubt, just push into the forest and watch for occasional tape markers, The track scrambles steeply up the ridge to point 541. From here, the gradient eases, and the route becomes a pleasant meander along the spine of the range. At points the track can be very vague, with many false trails. If in doubt, keep on the ridge and watch for tape markers -- the track never strays far from it. It rides over the top of about three little hillocks before winding through some large blocks, passing a tiny tarn, and climbing easily onto the Footstool (835m). There is room for a bivvy bag here and not a lot more. The track drops steeply off the Footstool to a bush saddle. While descending, it is very easy to get offline, so keep an eye on the location of the saddle. If the route becomes a near vertical plunge through trees, you may be off line and dropping into the sound. There is some camping space on the saddle, with a better campsite a few minutes' further on, plus a puddle of drinkable water. Kiwi and kea may be heard from here. The track continues along the ridge, soon breaking out into scrub. Look back and take a note of the location of the track at the bush line and a bearing: it can be hard to find the track on the return journey and there are a few false trails (once again: check your route is dropping along the ridge, not down into the sound!). Mitre Peak from the Footstool • By Matthew. Licence: cc by-nc-nd. The ridge climbs through snowgrass, then bends toward the sound and flattens off. Straightforward travel over rock, with impressive sculpted cliffs appearing ahead on the Sinbad Gully side and sheer, uncompromising cliffs dropping to the sound on the right. 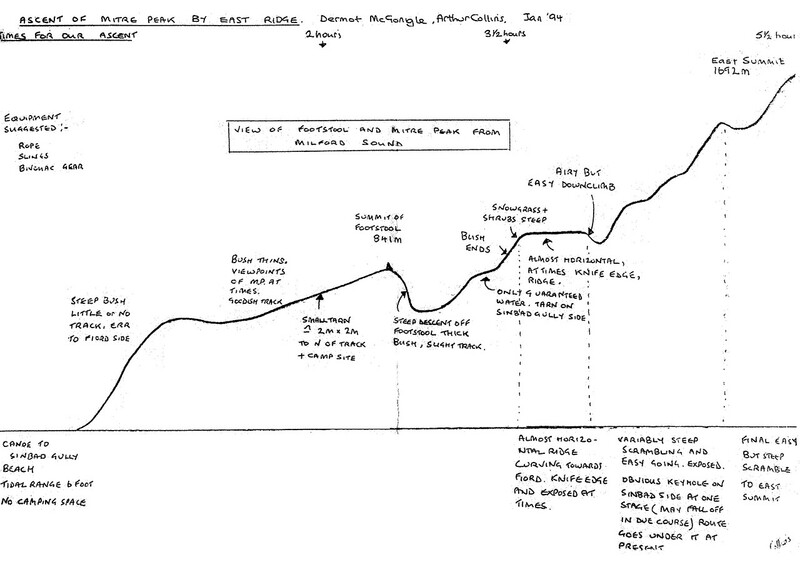 The route edges past a knob on the sound side (generally this side is drier and less slippery) and comes upon a significant notch (point 1302). Beyond here, the route is airy and exposed. 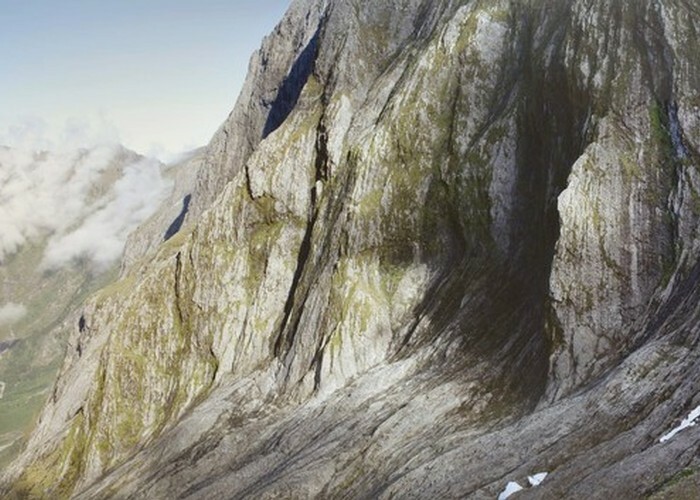 Some climbers use ropes from here, while others free climb it. Trampers should be assisted by a climber who can protect the route properly. A brief and careful climb down into the notch is followed by a longer climb out the other side and up toward the summit. The route eases near the summit. Rock wrens will keep you company. Added 6 January 2011 by MatthewMatthew. No revisions. 2,865 views in the past year (239 per month).